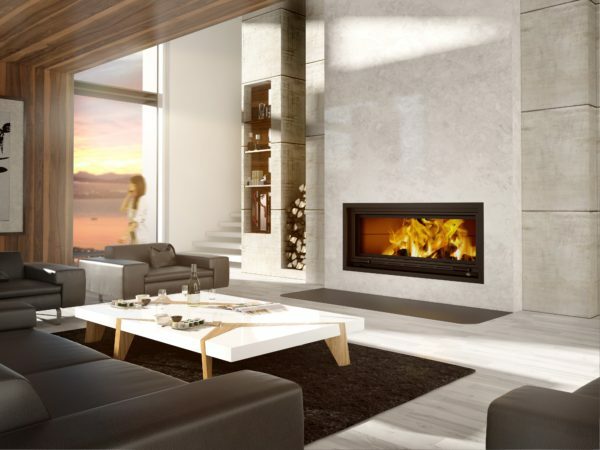 This amazing large decorative wood-burning fireplace will become the centerpiece of your home. Its perfect rectangle gives it a sleek, modern look and its elongated shape produces a warm enchanting effect in the room. Decorative. This sleek, wide model showcases the beauty of the flames. Convenient. Its guillotine glass door is easily lifted to provide ample room for loading wood. Secure. The fire screen, also equipped with a guillotine mechanism, makes you enjoy the warmth of an open fire and a natural effect in complete safety.